Balconies of these two apartment blocks in northwest France by architect Philippe Gazeau protrude like a set of open drawers. 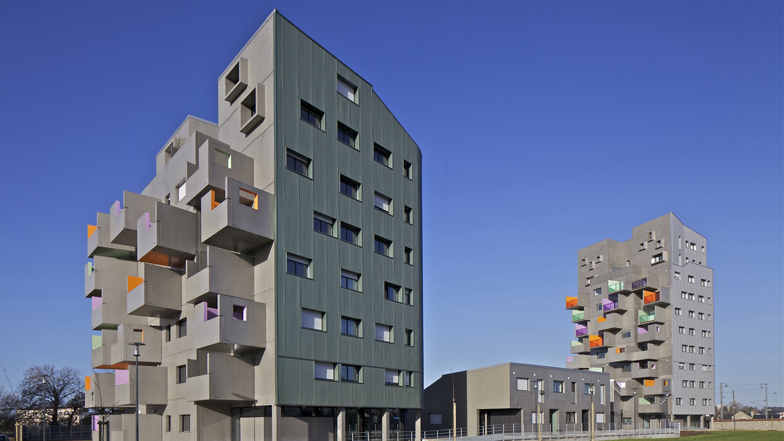 Located on a former military site in La Courrouze, Rennes, the residential development features two towers and two rows of houses surrounding a patch of grass with a car park underneath. Elevations of each building are coated with a surface layer of concrete or clad with sheets of ribbed metal, giving them a uniformly grey appearance. Balconies are positioned on the south-facing elevations of the two high-rises and feature brightly painted inside walls and coloured glass balustrades. The completed project provides a total of 76 new homes for the La Courrouze development zone, a growing neighbourhood that covers an area of 140 hectares. Previously Philippe Gazeau also designed a library with a criss-crossing metal exterior - see it here. The BH2 programme is located at the north-east end of the ZAC mixed development zone, in the "Bois Habité" area. It is bounded by the Rue Claude Bernard to the east, and by the Boulevard de Cleunay to the north. To the east, the shale wall demolished during the work to widen the Rue Claude Bernard will be rebuilt along the new boundary. As a former military wasteland occupied by large workshops, the current land is flat overall and the landscape elements and the vegetation existing on the land are of no particular interest. The free layout obtained through the "campus" concept is used to optimise the environmentally-friendly quality and performance of the adopted solutions, and in particular the layout of the constructions with respect to their orientation, the treatment of the well exposed frontages, and the urban composition with respect to the urban landscape both in the immediate vicinity and further afield. The taller tower block is located in the northern part of the land and does not cast a shadow on the other buildings. Its position on the edge of the site justifies the building’s outline as a tall signal. The two high-rises share a semi-underground car park and are joined together by its terrace roof forming a common plaza. The terraced houses are set on this walkway slab. This architectural and urban arrangement made up of the two towers and the terraced housing forms a constructed sequence between the large central garden and the landscaped area of the former stadium. These two broad open landscaped spaces leave a clear view from the lower housing units. The treatment of the three other facades and the top is handled in different ways from one tower to the other, taking into account their height and site location and with respect to the surrounding landscape. Along the Rue Claude Bernard the housing units between the central garden and the old shale wall left standing have continuity of scale with the existing programme to the south, and a degree of volumetric freedom with respect to the other buildings in the operation. It is a predominantly horizontal construction comprising a strip of terraced, superimposed duplex apartments. Sited at the interface between the street and the inner garden, the small block is set away from the noise of the street and the new shaft, opening up broadly onto the garden. On the second floor level, a succession of gabled volumes, slightly set back from the main R+1 building, produces an effect of houses set on a shared terrace roof. Likewise, on the west side, on the ground floor of the private gardens, the coloured boxes of the kitchens projecting out from the linear volume give a homely scale to the whole. We chose to restrict the number of materials used, chosen for their aesthetics and durability, and their ability to blend together inside the operation and with their nearby urban setting, as well as their potential technically to meet the targets of passive insulation and long-term economy set for this project. The colours associated with these materials tend to set them off against each other, and to emphasise to a greater or lesser degree certain special features linked to use (loggias) or to volumetric and architectural expression (the tower facades). The facades on the north tower are covered on the north, east and west sides from the first to the eighth floors with vertical corrugated metallised cladding, and the same cladding for the last two floors. The ground floor base is lined with black brick. The entire height of the south front is in surface coated concrete, its taupe colour verging on rust, likewise on the outer faces of the terraces - projecting loggias. The inner faces of the loggias are in brighter colours, greens, yellows, pinks and reds, to make these "outdoor rooms" feel more like part of the home. On the top floors the solid breast walls on the projecting boxes are replaced by coloured glass guard rails. For the cladding covering the south tower, the colours are treated dissymetrically: dark green on the inner garden side, metal grey on the west side. The south facade is handled in the same spirit as the other tower. The sloping roofs over the volume of the stairwell on both towers are fitted with solar panels. The duplexes on the top floor are used to build all the technical aedicules into the tower volumes (on the non accessible landing). Only the stairwell volume is extended to offer easy access for maintenance of the roof and solar panels. The six housing units at the foot of the two towers are sheltered by surface coated concrete shells in the same colour as the towers. Their sloping roofs consist of dark green steel deck. The kitchens projecting out on the west side are covered with dark green and anthracite ribbed metal cladding. The small block on the Rue Claude Bernard uses the same materials and colours. Surface coated concrete for the first two floors, metal grey cladding for the second floor houses, dark green and anthracite for the projecting kitchens on the west side ground floor. The south side of the slopes on the two roofs on the houses on the terrace roof are completely covered and sealed by a set of built-in solar panels. The north slopes are made from dark green steel deck. The rendering from the facade to the corner extends that of the rebuilt shale wall.